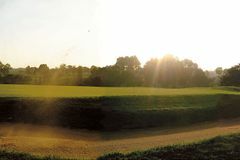 Widely known as the oldest golf course in the country, Acquasanta is also one of Italy's finest, boasting a stunning parkland layout, less than 5 miles from Rome's greatest attractions. Since official establishment in 1903, the course has retained its history and authenticity and still proves challenging to golfers of all levels. While not the longest, Acquasanta is a course in pristine condition and requires intelligent course management, especially on narrow fairways bordered by pine trees, cypresses and eucalyptus. The course is accompanied by a traditional clubhouse as well as other great facilities including a driving range, outdoor pool and even a gym. For the modern era, Acquasanta plays a short 6,000 yards, but this course boasts much more than length. Set in a rural environment, the parkland layout allows for typical challenges, especially on the 17th where you play downhill to a green protected by both bunkers and streams running parallel to the greens. To be truly successful, you will have to ensure you're considered in your shot selection as wayward drives and an unmeasured short game can lead to an uphill battle on many holes. The 7th gives your rewards for your work however, where a blind drive round a dogleg left opens up to stunning views of the Via Appia Antica Arches. Although, there are other impressive landmarks to see from various points around the course including views of the Old Roman Claudian Acqueduct and Mausoleum of Cecilia Metella. Despite hosting the Italian Open three times, most notably in 1973 when Tony Jacklin walked away victorious, the course is probably a tad short for the modern professional. However, low handicappers should not be deterred due to this nor should the high handicappers for its tricky hole-by-hole tests as this course truly offers something for everyone. Away from the fairways, but not too far, are some of Rome's famous tourist attractions. Just five miles from the city centre, Acquasanta is also a mere three miles from the jaw-dropping colosseum, meaning you can tick that off the bucket list. Closer to the course you can perfect your swing on the driving range, get your blood pumping in the gym, enjoy a refreshing swim in the outdoor pool or simply enjoy a beer in the clubhouse overlooking the beautiful course.